Trieste as an Italian city is not frequented by the regular traveler. But it should be. The mountains and the mighty Adriatic makes Trieste a very unique city and there is also that unmistakable charm since it is a port town. 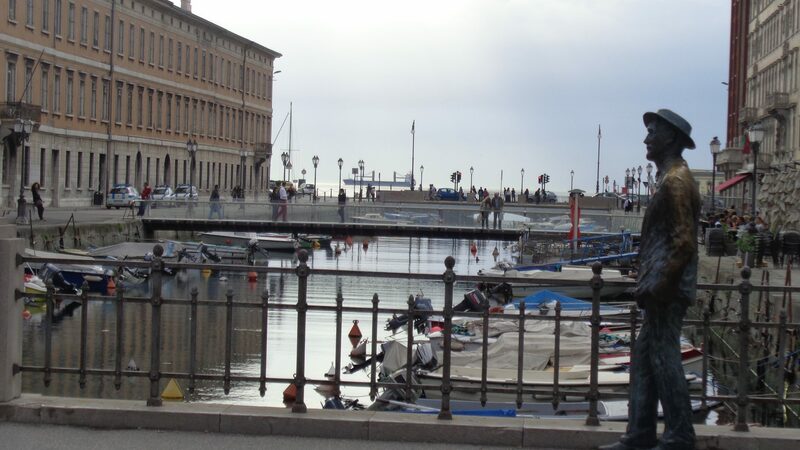 Trieste as a city has been known to have attracted a lot of writers and thinkers since years. One of them was the notable Irish writer James Joyce. He along with his standards of coffee are very famous and that is why this post is important because it tells where to have coffee in Trieste- Joyce style! So when I was in Trieste standing next to Joyce’s calm and smiling statue, I decided to follow his footsteps. Joyce lived in Trieste for more than a decade from 1904 till 1915 and it was his city, a place he loved and greatly admired. Trieste stole his soul and it is evident when you walk around the city. Several alleys, B&Bs, hotels, museums and coffee houses have dedicated themselves to Joyce and his time in the city. It is a wonderful feeling being in the centre of it. Literary Italy is fascinating…..!! Did you know the famous coffee brand Illy is from Trieste. Joyce often went to many old fashioned coffee houses in the city. But my favorite is below! Antico Caffè San Marco should be your spot if you are looking for anything related to coffee and James Joyce in the city. Ask the way Joyce had his coffee and you will be offered a Joyce special and told about the history. San Marco is also a huge bookstore where book events are held regularly and is definitely a MUST VISIT on your Trieste trip. Other notable places to have coffee in Trieste are Bar Italia, Caffè degli Specchi and Caffè Pirona. Apart from these cafès, Joyce also wandered in other parts of city such as the well known Theatre Verdi and the church of San Nicolo. He, along with his writer friends Umberto Saba and Italo Svevo, were part of the city’s literary drama and culture. It was not unusual for me doing a tour of the city with the ghosts of the literary past. I travel in search of literary references wherever I go and Trieste just happened to make it doubly special. Trieste is well connected by all major cities of Italy. I took a train from Florence and booked my tickets with Trenitalia. Trieste is closer to Venice since it is at the far eastern corner of Italy. It makes a great base to explore Slovenia and Austria. Have you read these great books by the writer James Joyce?? You can simply click on them and buy! Happy 2016 from one Coffee lover to another. Cheers to that, fellow coffee lover 😉 Happy 2016! Bringing in the New Year with coffee and beautiful Italy! Happy New Year! So interesting. I know virtually nothing about Italy. Your blog is helping me organise a trip sometime in the future. Sounds strange but I have to get England out of my system first. I travel alone so am a little worried about not speaking the language. I travel alone too. Don’t be worried. It l all go smooth. I haven’t been to Trieste but long to go there. And I didn’t know that James Joyce stayed there for so long either. Another writer I admire from Trieste is Italo Svevo, another reason to walk those streets. There’s a statue of Svevo as well on the other side of the main Piazza. Thank you. Il surely have a look..
😮 To think of how many times I was there and had no idea about the statue. Thank you very much. Oh, sure, I can visit when I wish. Usually I’m just passing by. Then you have a long list of things to see 😀 any favorite caffes from Trieste? Sadly no. 🙂 Will need to visit it a lot more, I see. Looks like my kind of place as I sit here sipping my espresso ☺ You have added another town to my growing list of places I want to visit. It totally is, Rae. Really peaceful sitting at the Piazza. I hope you visit it next year. Oopps I mean this year 🙂 😉 buon Anno once again! What a great start to the new year! All the best for 2016!! Thank you as always for your encouraging words. Happy 2016, Darlene! I love getting acquainted with literary history when I travel! I didn’t know Joyce lived in Trieste; maybe I’ll make it there sometime. Thanks Kaitlin. Me too, I literally follow Bookshops where I go 😉 I hope you visit! Happy new year Susan! 🙂 thank you. its really your kind of place.. Thanks Shekhar 🙂 Knew u’d enjoy it. lucky you! Italy, coffee and James Joyce all in one! Thanks for posting this, I’m a Joyce fan. My mother and I watched ‘A Portrait of the Artist’ (1977) last week on DVD. Very good film. It really is 😀 you must visit!! I love little things about Italy too like you mentioned. Thanks a lot Arcane 🙂 Wish you the same. Lovely post, beautiful photos and I learned something. thanks again for liking my post, have enjoyed your interesting ideas . Always welcome 🙂 n thank you! I recently visited Trieste and found it had a very Mittel Europe feel to it, an Austrian legacy? But you’re right when you say that its proximity to the sea and mountains gives it a unique feel. Definitely one to visit again! Lucky you. I want to go back again..very Austrian. Especially now that I visited Austria and could relate more. My boyfriend was born in Trieste 🙂 I had the chance to visit the town only once (we met abroad and have lived abroad ever since, so there were not so many occasions) and I loved his hometown! I would like to go back and spend some time there one day. Yeah, unfortunately we stayed only for a day, as we were driving from Budapest to Torino and Trieste was only a quick stopover. Most of his family lives in Rome, so we visit Rome much more often. Oh, this is very interesting! I love James Joyce but I didn’t know he lived in Trieste. I’ll have to check it out tomorrow. you will love it. He has his mark all around the city.